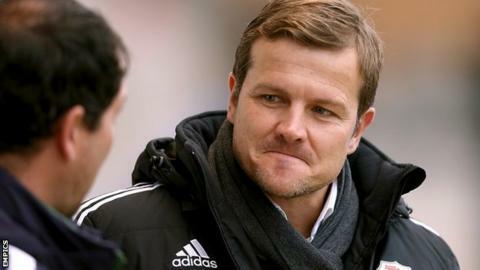 Swindon boss Mark Cooper is hoping his players can progress to the Johnstone's Paint Trophy final at Wembley after they beat Stevenage on penalties. The Robins, who reached the final in 2012, now face Peterborough in a two-legged southern area final. "It's a fantastic opportunity for any player to go and play at Wembley," Cooper told BBC Wiltshire. "I never managed to do it, or get anywhere near. Whatever level you do it at it's something to be savoured." He added: "I'm sure our boys will be trying to make sure they get the because you never know when it come around again." The semi-final against Stevenage finished 1-1 in normal time after Nicky Ajose put the Robins ahead before Francis Zoko levelled late on. Two saves in the penalty shoot-out from keeper Tyrell Belford, making just his fourth professional appearance, helped Swindon progress but Cooper believes the youngster still has room for improvement. "Ty has done well again, but I think he'll probably feel he could of done a little bit better with the goal," he continued. "Hopefully he does well again in the final in what's going to be massive game against Peterborough." Asked if they practised penalties Cooper responded: "Nope. It's impossible to recreate the atmosphere and the pressure. "I just picked five players that I thought could handle the pressure and I said to them whatever you do get your foot through the ball. "I would rather it goes over the stand than the keeper saves it."